Everything in life carries a price, and I'm not talking about just money. When you are young, and you don't have an income, you tend to see things mainly in terms of whether or not you have cash in pocket. In fact, yesterday, I overheard a conversation between two boys which illustrated this very well. I was in "Dollar Tree" investigating the cheapest of the cheap when it comes to Valentine's options. Please note that I wasn't doing this to make an actual gift purchase. This was sociological "research" of a sort which I am prone to doing. A handful of college-age women were standing in the aisle goofing on the Valentine's items and that itself was worth the trip. It's more than ironic to hear them make fun of things which they will more than likely purchase. It's also exactly the sort of thing I did at that age when I was too cool for the things I actually liked and could afford. There were also a couple of boys, around the age of 10 or so, who came in and headed for the candy aisle where I was contemplating a bag of "Red Vines" (for my husband, who loves all sorts of licorice). They were talking at length and explicitly about exactly what they could buy. One of them was saying that one could buy two items and the other could buy one because of the taxes. The other was saying tax was included so they could each get two things. The first kid seemed dubious of this assertion and nervous about going to check-out without the extra scratch to cover tax. Their exchange made it clear that they had $4 only between them, and one of them said they needed to get things that would last. In other words, they wanted to buy the biggest snack for their buck. Value for their limited dollars was the only price they considered. Now that I'm older, and I have a few more dollars at my disposal than the average 10-year-old, I know about other expenses like nutrition and calories. There is the value that comes from how pleasurable something is. My husband has called this the "calorie to enjoyment" ratio. It's when you learn as an adult that your body is not a garbage disposal and you care about how good something is rather than how much of it you can get for your cash. When you're a kid, and money is scarce and the body is nearly invincible, such concerns aren't even on the radar. In America, the concept of overall quality rather than only quantity is a little out of place. Most people are looking for how much they can get, not how good what they get is. I grew up very poor, so I more than understand this as a fact of life for many folks. Nonetheless, even people who have more money view "value" as something they get only if there is an enormous amount of something (hence the outsize portions in restaurants). In Japan, well, they see value based on a variety of factors including how it is packaged (for both convenience and style) and what the experience of eating it is like. not-too-sweet chocolate with unique textural properties. They are truffle-like confections served up in tiny sizes. They are rich, chocolatey, and melt in your mouth. The best way to eat one is to place a firm little square in your mouth and allow it to dissipate into fudge-like goo. It's a textural and taste delight which is wasted otherwise. 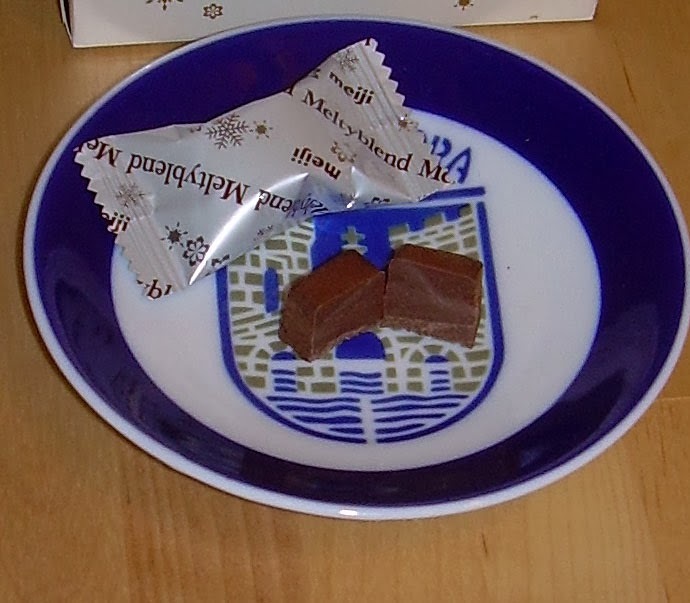 The flavor of this "creamy chocola" version is a little lacking in complexity, but is still well worth it. The chocolate part hits you up front because of the dusting of cocoa powder. As it melts, the sweetness reveals itself in increasing layers. This works in part because it off-sets the somewhat bittersweet nature of consumer-level Japanese chocolate and it even goes some distance toward mitigating the sometimes unpleasant (coffee-like) aftertaste of Japanese chocolate. 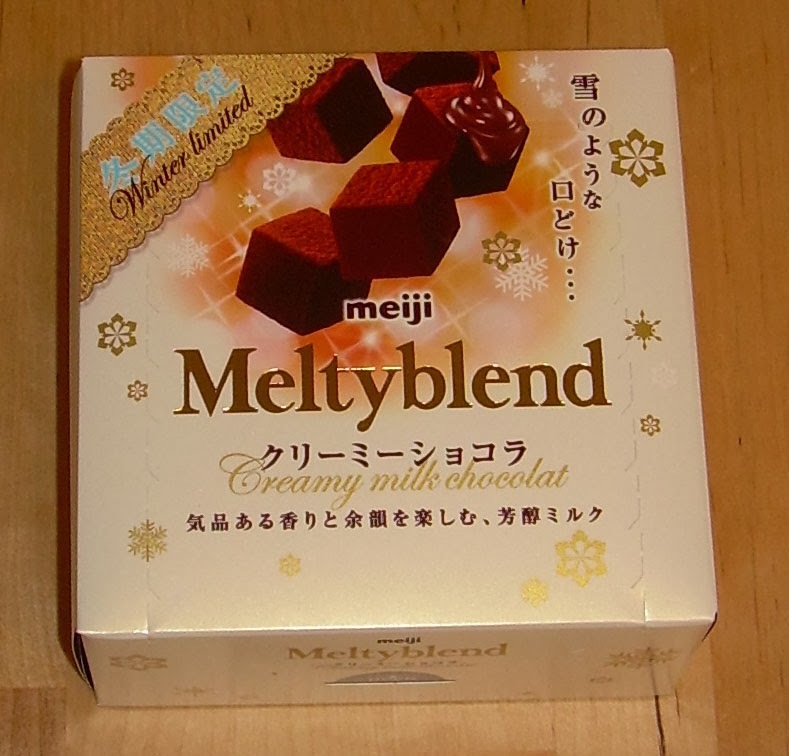 Incidentally, this type of Meltyblend/Melty Kiss (creamy chocola) is ranked the most highly on Meiji's site.